• Andrea Iannone set the 4th fastest time but starts on front row due to penalisation of the pole sitter. • Alex Rins on third row and feeling confident. • New Sunday race time; 13:00 local time (05.00 CET). Saturday morning’s FP3 session proved to be largely dry, meaning that riders were able to improve on their Friday times. Andrea Iannone and Alex Rins were ready for this and slotted into the Top 5 early on. When the chequered flag flew Rins was 5th and Iannone 10th, allowing them direct passage to Q2. 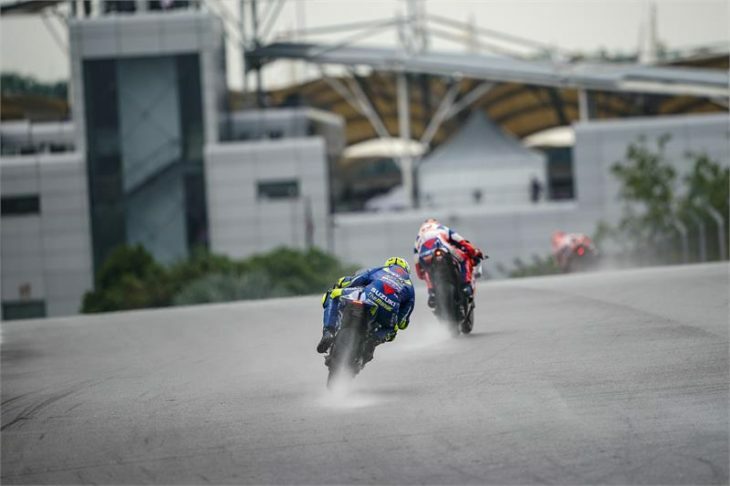 In FP4 there was a sudden heavy downpour which forced riders to change to wet tyres, Rins and Iannone were 5th and 6th respectively before the rain fell. With the rain becoming heavier and the track becoming dangerously waterlogged, officials took the decision to delay the qualifying sessions. When Q2 eventually got underway the conditions were still difficult to manage. Iannone and Rins showed very promising pace, with the Italian topping the fast Sector 4. In the closing moments the pair were bumped to 4th and 8th respectively. A subsequent penalisation for Marc Marquez, which saw him demoted 6 grid-positions, means Andrea Iannone will now start from 3rd place. Tomorrow’s NEW SCHEDULE now sees Warm-Up take place at 08:40 LT (01:40 CET) and the race brought forward two hours to 13:00 LT (05:00 CET). This is intended to avoid the wettest part of the day.